Erin Blegen: My Scrap Cabin: Manor House Warehouse Sale This Weekend!!! Spoil yourself for Christmas this year ! Here’s just a sample of what’s in the box. Now I know you’ll want to know how much you’re saving and how much you get…..well let me tell you. 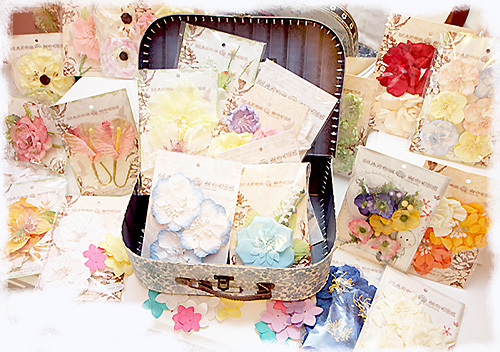 Yes, 20 of our flowers packs from our 2011 Spring, Summer and Autumn releases. Normally they retail between $5.50 and $7.50, that’s over $120.oo worth!!! But for a short time, they are a lot less than that! Just AU$45.00 for all this. I can’t tell you how wonderful it would be to have this arrive in the post! An absolute FLOWER-FEST! For 3 fabulous days, it starts THIS WEEKEND! Don’t miss this once a year offer to SAVE SAVE SAVE! The link to our shopping cart will be posted on Saturday. This looks like an awesome deal...but I can't work out where the sale is being held for us to buy??? Linda, the link to the shopping cart will be posted at the Manor House blog on Saturday !!! :D (noted at the bottom of the post)~!